Over the past few months here at Everlast Group, we have been extremely proactive in the world of Social Media. Communicating with existing clients and potential new ones is important to us as we like to build good working relationships and highlight the fantastic projects that our dedicated teams are working on. Because of this increase in social media exposure and the sheer amount of project news from our divisions, we took the decision that as of the 8th September 2014, each division would have its own divisional pages on our Social Media platforms. We will still continue to post important Everlast Group news on our main pages, but the specific divisional information can now be found on their new pages on both Facebook and LinkedIn. 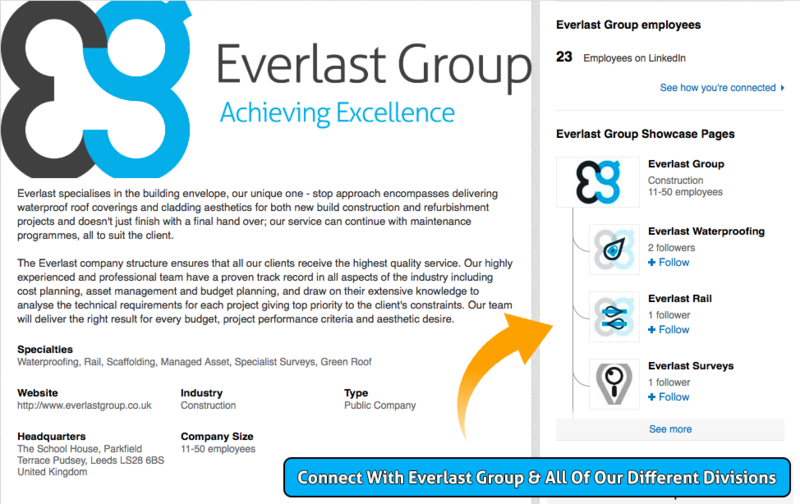 To find our new divisional pages on LinkedIn, navigate to our main Everlast Group page on LinkedIn (the link is on the bottom of our website’s homepage) and the divisional pages will then be displayed on the right hand side of the screen. This graphic shows where the new divisional pages can be found. Here is the information that you need to find our divisional pages on Facebook. We look forward to your business being connected to ours. The team at Everlast Group.